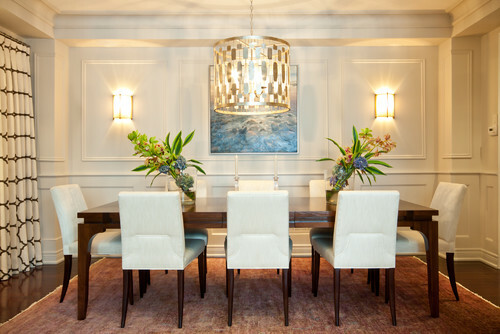 When searching for tips in buying light fixtures for a dining room, the first suggestion is almost always a chandelier or a pendant light, because they are both able to provide light and focus on the table. However, there are a few other different ways you can illuminate your dining room and we are here to help you choose which lighting fixtures would be best given the specific size and height of your area. While we are going to focus on the perfect lighting to install above your dining table, do not forget that layering is a must to have a well-illuminated space. Having recessed fixtures strategically mounted throughout the ceiling will help provide a bright glow all around the room. Accent lighting in built-in shelves can highlight treasured dishware and other ornate pieces. A chandelier would make a great focal point in a dining room. However, it is crucial that your choose one that will not be too overbearing, so be careful to get the right size. You don’t want your chandelier to be bigger than your dining table’s width. While the general rule is to limit the size of your chandelier from 24 to 30 inches in diameter, another way you can determine the right size for your chandelier is by measuring the width of the dining table. The maximum diameter of your chandelier should be about 1 foot smaller than the table below it so that there is a clearance of 6 inches from each side of the dining table. It should also hang 30 to 36 inches from the surface of the table. This way, you have enough vertical space to place a tall center piece and also see the ones seated across the table, while at the same time avoiding any injuries while guests are getting up from their seats. 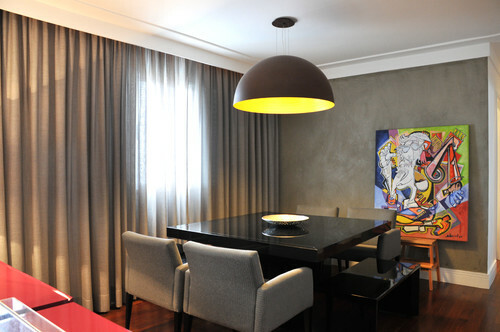 The slimmer, more modern look of a ceiling pendant makes it another popular option in illuminating dining rooms. 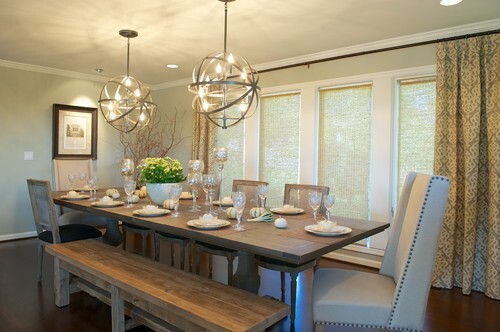 Depending on the size of your table, you may need to have 2 or more pendant lights installed in a row or as a cluster. Like chandeliers, pendant lights need to be hung with the bottom 30 to 36 inches above the dining table to avoid any accidents or injuries. If you have a relatively small dining table, you may hang a pendant light a little lower to create a more intimate setting. Cove lighting consists of tubes or other shapes of light which are mounted high up on walls or ceilings, usually hidden in architectural accent pieces, such as crown moldings and ledges. A dramatic glow of light is produced by placing a narrow piece of cove tube lighting inside a ledge which is attached to the crown molding on upper parts of adjoining walls. Because of its eye-catching and dramatic qualities, cove lighting is often used in theaters and bars. 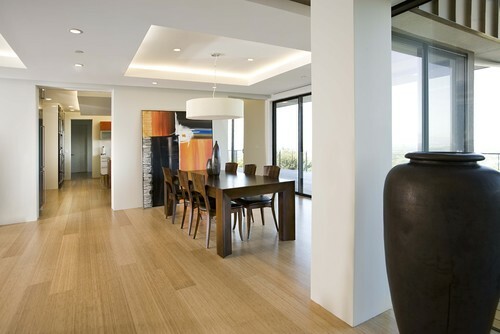 But aside from these, cove lights can be a great source of ambient lighting in the dining room. Add warm sophistication and drama to a formal dining room with the glowing light effect on tops of the walls as well as the sides of the dining table. Flush mount lighting is installed flush with the ceiling, which makes it the perfect light fixture for smaller dining rooms with low ceilings below 8 feet. For ceiling heights of 9 to 10 inches, semi-flush mounts are recommended. The slightly higher ceiling can allow for the 4 to 8 inch distance between the ceiling and the main part of the light fixture. Semi-flush lighting is more decorative compared to flush mounts, with a wide range of designs and finishes. Wall sconces can be blended seamlessly into your dining room décor in a fluid manner or added in a color that will complement the rest of the room’s design. You can mount the wall sconces along your entry way into your dining room, or at the opposite end on both sides of an artwork placed above the console. A pair of table lamps placed on both sides of a sideboard can wash the walls with light for subtle ambient illumination. 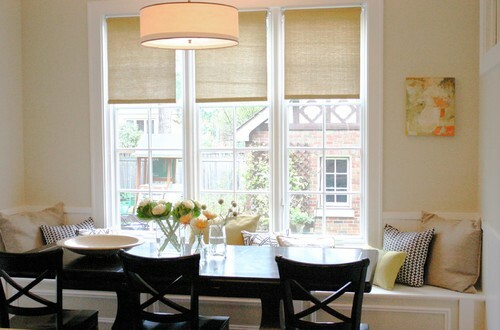 Lamps add a cozy feel to the dining room and are easy to move around unlike wall sconces.